Organize your food and drink station in one spot in the yard, patio or deck. I like to use pieces of furniture in unexpected ways. 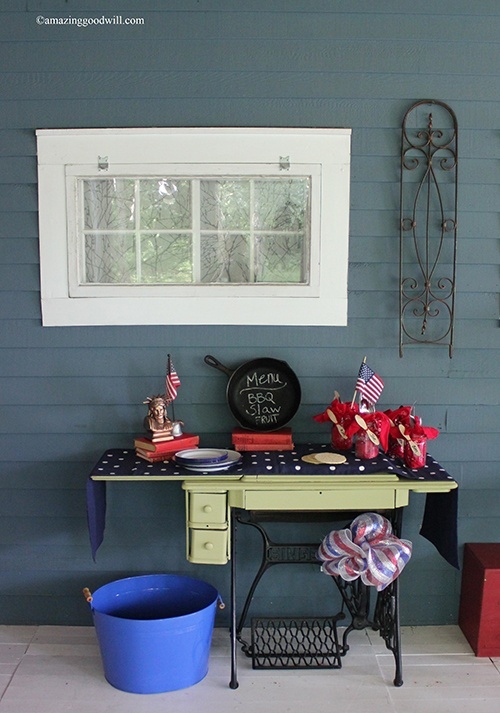 An old treadle sewing machine is perfect for entertaining. The top opens up for additional serving space. I just covered the sewing machine opening with a large bread board. Start your color story with a table runner. If you’re feeding the gang on the 4th of July, red, white and blue is a must. Picnics should be effortless and easy. Bandanas are not only colorful, but make perfect napkins. Tuck them into Mason jars and add silver (or plastic!) utensils. Just to make things personal, I wrote everyone’s name on a wood spoon and tied it to the jar with rick rack ribbon. They’re a hint to what’s for dessert. I love those little ice cream cups. They stay frozen in a cooler, are easy to eat and don’t require any baking or preparation! Before dessert is served, let your guests in on the dinner menu. Chalk board paint is all the rage, but this idea is easier and faster. 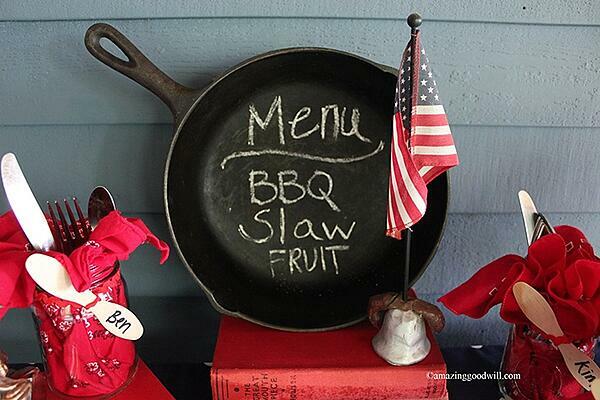 I found a vintage cast iron pan at Goodwill and propped it up on red books then wrote the menu with chalk. Not only do you have a unique sign, you have a new pan for cooking next week! 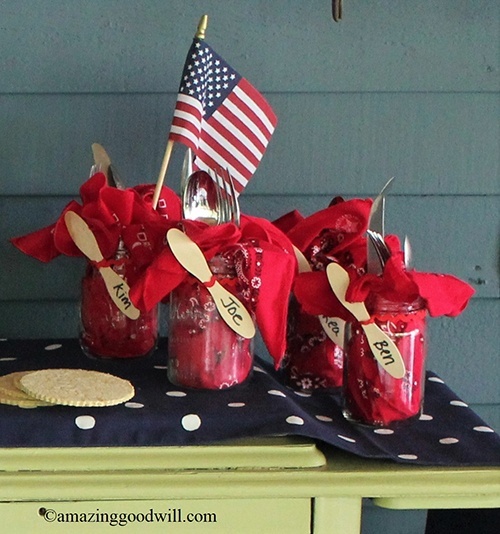 Add a few decorative items to go with your BBQ theme. 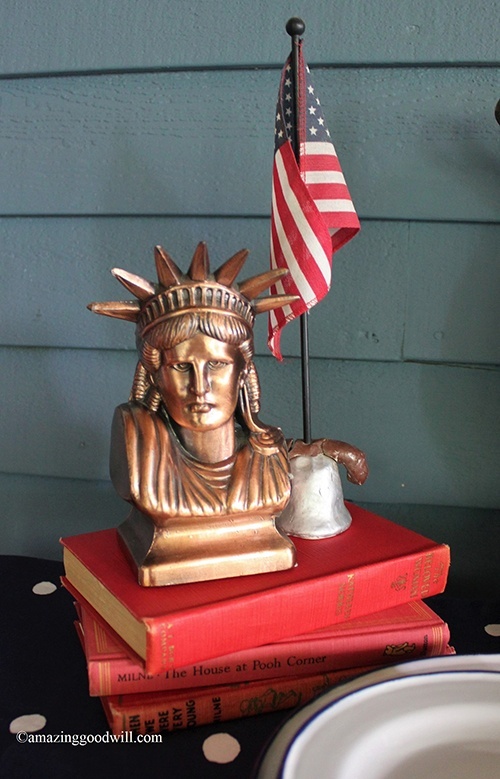 For the 4th, add flags, bunting and a Statue of Liberty.